The four stages of enlightenment in Theravada Buddhism are the four progressive stages culminating in full enlightenment as an Arahat. These four stages are Sotapanna, Sakadagami, Anāgāmi, and Arahat. The Buddha referred to people who are at one of these four stages as noble people (ariya-puggala) and the community of such persons as the noble sangha (ariya-sangha). In the Sutta Pitaka several types of Buddhist practitioners are described, according to their level of attainment. The standard is four, but there are also longer descriptions with more types. The four are the Stream-enterer, Once-returner, Non-returner and the Arahat. The fourth stage is that of Arahant, a fully awakened person. They have abandoned all ten fetters and, upon death (Sanskrit: Parinirvāṇa, Pāli: Parinibbāna) will never be reborn in any plane or world, having wholly escaped saṃsāra. An Arahant has attained awakening by following the path given by the Buddha. 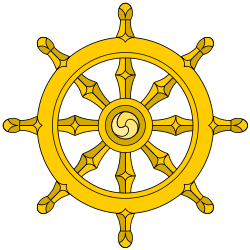 In Theravada the term Buddha is reserved for Siddartha Gautama Buddha, as being the one who discovered the path by himself. ↑ Ajaan Lee Dhammadharo. "What is the Triple Gem?". Retrieved August 13, 2016. ↑ "Sangha". Retrieved August 13, 2016. ↑ "A Path to Freedom: A Self-guided Tour of the Buddha's Teachings". Retrieved August 13, 2016. ↑ Armstrong, Steve. "The Practical Dharma of Mahasi Sayadaw". Buddhist Geeks. Retrieved August 13, 2016.